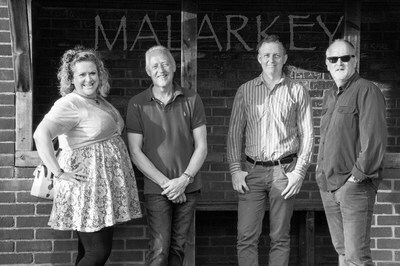 Malarkey is a versatile 4-piece covers band based around the Berkshire - Hampshire - Surrey borders. Jeremy (aka Jem, Jez and a few other less polite things) is a musician, songwriter and producer who has been involved in many aspects of the music business in the past. He taught himself to play guitar and was involved in the 70's music scene - this included playing in bands supporting names such as Dr. Feelgood, Sad Cafe, Mungo Jerry and Humphrey Lyttelton (!). He also played in a band with Karl Walllinger (The Waterboys, World Party) and worked for Jethro Tull at their studio in Fulham. I mostly play drums.....and tell jokes....(Ed. not sure which he's best at). After serving a 4 year penance in Spain for being "a bit cheeky", Pete, Malarkey's original bass player has returned to the fold on the understanding that he will be a good boy from now on and will only speak when spoken to. Welcome back Pete...... wheres me duty free? ?